Khula Aasmaan was selected as a social innovation and presented at National Conference on Social Innovation 2017 (NCSI). This annual conference was organised by National Innovation Foundation of India, Tata Institute of Social Sciences and Pune International Centre. (L to R) Dr. Vijay Kelkar, Milind Sathe, Shri. 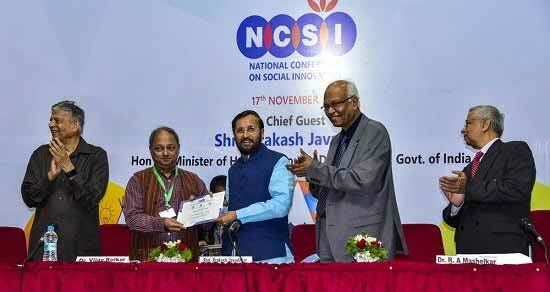 Prakash Javadekar, Dr. R. A. Mashelkar, Shri. Jayant Umranikar. Khula Aasmaan is a platform for creative expression by children, with a special focus on the underprivileged, rural, tribal and remote communities. Khula Aasmaan is free and addresses two age groups - 5 to 15.